With the launch of the Pixel 2 and Pixel 2 XL, Google updated the Pixel Launcher with a cool new trick that took you from light to dark theme depending on the lightness or darkness of the wallpaper you set. They didn’t announce it, but it’s there and it’s pretty well done. I have a suggestion, though, that’ll take this trick one step further. The dark wallpaper shade and dark app drawer should switch when you enable Night Light. Think about it. I may not always want a dark wallpaper. In fact, during the day, the last thing I want is to experience the darkness that is a dark wallpaper with dark notification shade, and dark app drawer. 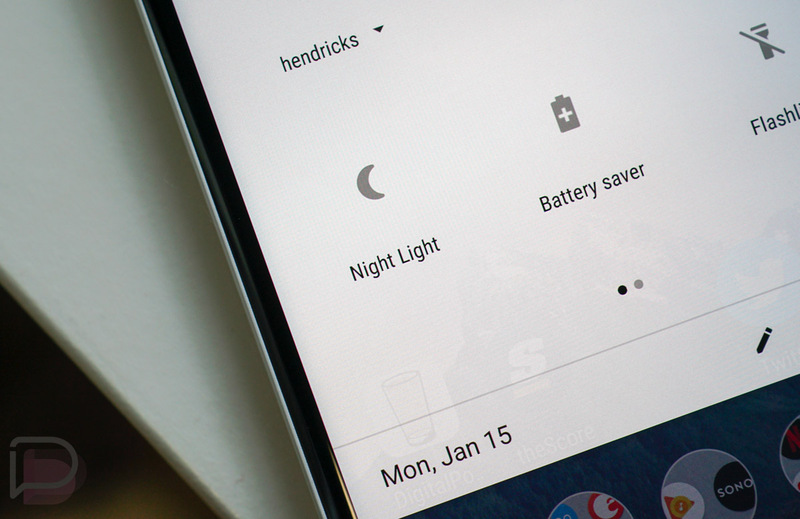 I like my Android experience light during daylight, but as that sun goes down and the lights in my house go off, I’d love for that shade to get darker, without me changing wallpapers. And that’s where Night Light (the mode that adds an amber tone to your screen to ease the strain on your eyes) comes in. You see, I’m addicted to Night Light on all phones. I use it so frequently, that I not only have a shortcut to it in my notification shade top 6, I also have it scheduled to automatically come on at 8PM every night and turn off again at 6AM. It’s also called “Night Light,” which works perfectly with the idea of a darker, easier-to-read setup on your phone when it’s dark. 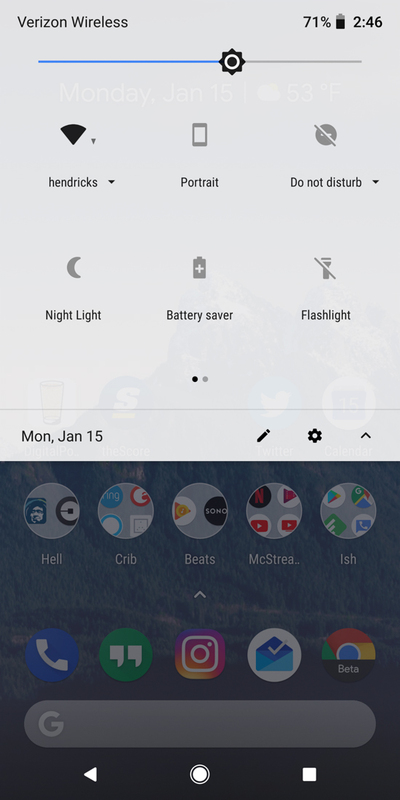 Night Light could easily also utilize the dark theme that Google created, yet seems to only want to attach to wallpapers. 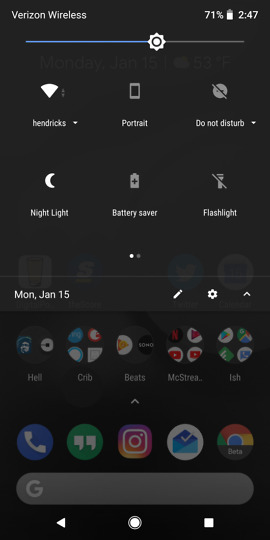 Allowing Night Light to toggle between dark and light themes makes absolute perfect sense. Now, you could argue that adding a light or dark theme toggle is probably an equally-as-good solution and I wouldn’t disagree. Google should allow for that to happen without a damn wallpaper switch. It’s just that part of the idea behind Night Light is for usage at night in low-light situations, to reduce eye strain. A dark vs. light setup at night certainly should factor into the thinking behind Night Light. 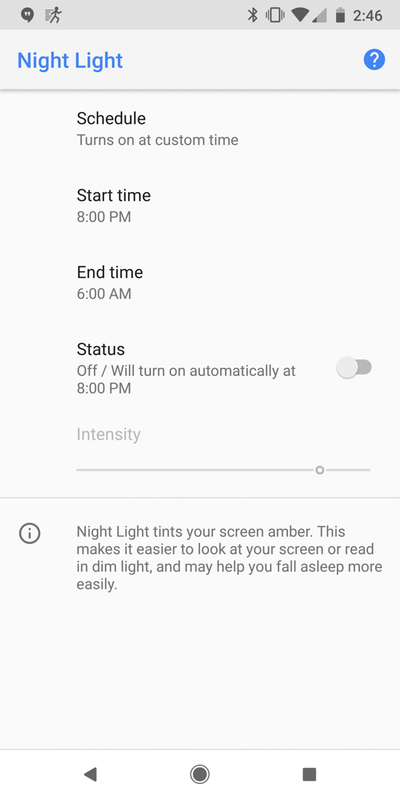 I’m telling you, even with Night Light enabled, a light notification shade will still blind you and light up a room. Better yet, maybe there should just be more advanced controls over wallpaper in addition to Night Light, where if it controls dark vs. light themes (Google does seem adamant about not giving us a toggle and instead made it randomly happen via wallpaper), that Google allows for daily schedules to enable dark vs. light wallpapers that’ll flip that UI switch. Sure, there are likely 3rd party wallpaper apps that can do this, but I’d much rather it be built in natively. You can do it, Google.